Something in the Water by Catherine Steadman is a highly recommended debut psychological thriller. The novel opens with Erin digging a grave on October 1st. Then we jump back to Friday July 8th, for the whole story and the reason for that grave. Erin Locke, a documentary filmmaker, and Mark Roberts, an investment banker, are getting married. In spite of the fact that Mark was recently fired from his job, they planned to go ahead and enjoy a dream honeymoon on the tropical island of Bora Bora. While out scuba diving they discover something in the water, a canvas bag. The contents have the potential to either dramatically change their lives, or threaten their safety. It will certainly test their moral compass. Erin and Mark need to be careful and clever to maneuver their way through the ensuing chain of events. Steadman's novel features Erin telling the story of what happened that lead to her digging a grave. While we know what Erin is thinking and doing, it is also easy to see that she is making some bad decisions and may be an unreliable narrator. Erin isn't entirely likeable. Mark also comes across as untrustworthy. But, Something in the Water isn't really a novel that focuses on character development as much as the motives, actions, and reactions of the characters. The writing is good. There are some universal truths in the plot - greed, mistrust, suspicion, lies - that are nicely integrated in to the story. The novel does feature some twists, but none of them are startlingly unexpected and astute readers will see most of them coming. What Steadman does do well is providing a gripping opening. Then, after a rather slow, uneven set up, the narrative again becomes more compelling and picks up the pace and the intrigue for the final half of the novel. 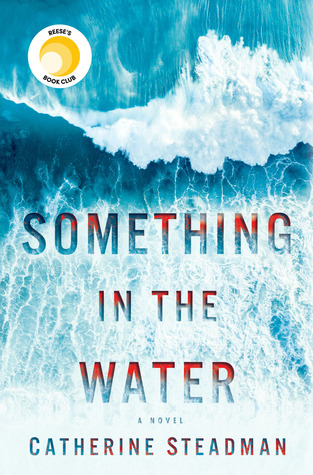 Something in the Water is a notable debut novel and Steadman will be someone to watch for future releases.